Zong creates international call package for its valued customers of Pakistan with phenomenal tariffs and incentives. This package has generated for all those people who have good social link in other countries of the World and they want to communicate with his/her foreigner friends on regular basis. The largest numbers of Pakistani people are living his/her life in other countries of the world and their families are worried about his/her who lives far from home hence this telecommunication has introduced a reliable Zong international voice feature for connecting with your overseas family member in a day. Zong Raabta Ticket offer provides reasonable calling charges of its subscribers and cellular operators who connected with this network service can afford this package to use on daily basis. In earlier few days ago this telecommunication has already launched exceptional international voice package with name of Zong one rupee offer for various countries and in this package this telecommunication provides smart international calling offer for other countries of the World. This offer easily attract of people for the activation because it gives smart incentives with cheap calling rates. This is such an amazing international calling feature for all those people who want to call on daily routine in foreign countries. This telecommunication has categorized various middle-east and Asia countries of the world in this feature. Subscribers can easily make unlimited phone calls without facing any network issue. 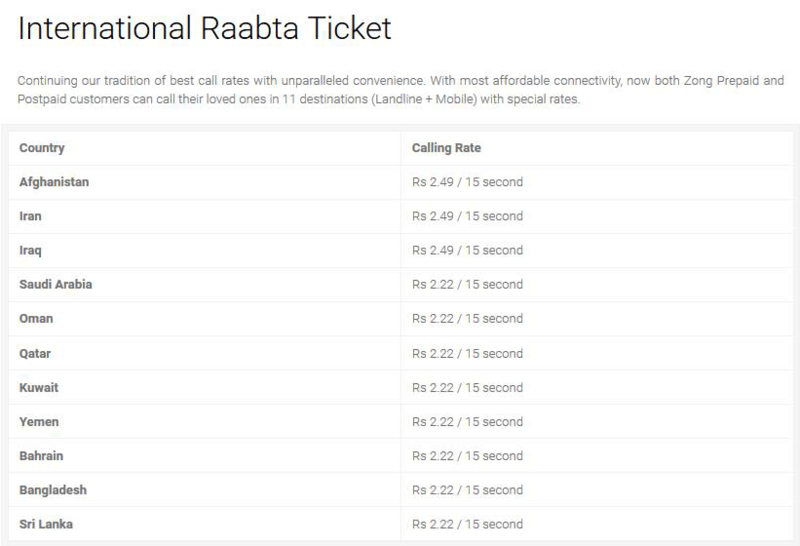 Mostly cellular operators think international calling package doesn’t provide proper network facility of users but from now consumers of this network are able to make lengthy international calls without facing any kind of network issue through Raabta ticket offer of Zong. This telecommunication is newest telecom company of Pakistan but now this is highly rank and reputed telecom service of Country because it always introduces packages with cheap charges and this telecommunication is also providing affordable charges to activate this feature to use for international calling facility. Customers just need to activate this service to enjoy non-stop international calling service with reasonable charges. This is reliable international voice bundle to serve facility to call 11 countries of the globe and cellular users easily connect with his/her other country friends or family members by using it. The subscription procedure is simple just need to dial *747# and press call button. Subscribers will receive message after subscription for the confirmation of activation. Daily subscription fees are RS 2.22 per day. Customers can DE-activate this feature through SMS just need to write SMS Unsub and send to 7474. This offer automatically subscribe for next day. Customers need to UN-subscribe this feature. This is daily base and limited time offer. This feature is available for postpaid and prepaid customers of Zong. This telecommunication reserves rights to DE-activate this feature without any specific notification or news alert. Customers can easily avail other Zong international call packages with this feature.